Q. What do you do when you confess to someone in your church, but the person is completely unwilling to see the logs in their own eyes and / or repent / confess to you? Especially when the other person is an ordained church leader? A. I am going to respond to the second sentence, the second part of your question, first. While you are absolutely on solid biblical ground to have a higher expectation for a humble response from an ordained leader, the fact remains that church leaders are also sinners who need the moment by moment application of the regenerating power of the Gospel as much as any of us. Not only that, remember also that the Bible warns that there are false teachers, shepherds, and leaders in the church (see, for example, Matthew 5:19; John 10:12; 1 Timothy 1:7, 4:2, 6:3-5; 2 Timothy 4:3; and 2 Peter 2:1). So, in my opinion, the heart of your question lies in the intent of your first sentence: “How do you cope with a fellow believer who is spiritually blind to their contributions to the conflict between you?” I hope you would agree that that is a fair restatement of your first question. First, I think it takes great wisdom, patience, and a heart overflowing with the love of Christ for a person who has been rebuffed in their attempts to reconcile to step back and say to themselves: “By their response (or lack thereof) I can see that that brother or sister is trapped in spiritual blindness and they are suffering. What can I do to gently lead them into sight so we can be reconciled?” Rather than seeing and interpreting the person’s lack of a humble response as “unwillingness” (hardness of heart) you have the opportunity to make a charitable judgment and approach the situation from an entirely different perspective. When I was serving on a church staff as a ruling elder, I had to learn to turn a personal attack or harsh rebuff into an opening to see the hurting hearts of the people speaking and acting in a way that was inconsistent with their own profession of Christ and their promise to follow his commands. When Christians refuse to do everything they can to be reconciled to other Christians, they are demonstrating rebellion to Christ and his commands to “be reconciled” (Matthew 5:24); “make every effort to maintain the unity of the Spirit through the bond of peace” (Ephesians 4:3); and, “as far as it depends on you, live at peace with everyone” (Romans 12:18). How do we help people stuck in rebellion to Christ? Especially when they don’t even appreciate the nature of their rebellion? The answer lies in our consideration of the first question: the problem of spiritual blindness. 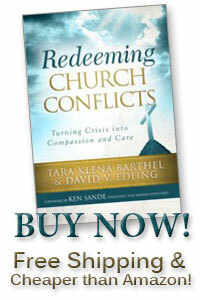 Spiritual blindness is so complex that Tara and I devoted an entire chapter in Redeeming Church Conflicts to it. One of the things that makes spiritual blindness so hard to handle is that those who are suffering from this serious condition don’t realize they are afflicted. Thus, it takes a spiritually wise and patient friend to come alongside and be a gentle guide. A biblical word study of “blind” and “eyes” and “heart” will unpack the Scripture’s comprehensive teaching on this subject. Meditating and praying on what you will learn should give you many insights into what to do in the situation you ask about here. Of course, that will only happen if (and only if) your attitude has been transformed by the Gospel of Christ to be a heart of compassion, committed to helping your trapped sibling in Christ, ordained or otherwise. This entry was posted in Biblical peacemaking in the church, Causes of Church Conflict, Conflicts involving church leaders, Disappointment in the church. Bookmark the permalink. 1 Response to How do you respond when fellow Christians REFUSE to repent / “Get the Logs out of Their own Eyes”? Initially they said that it would be wrong to respond to gossip at all, even very public gossip; all they could do is to tell people not to listen to it, and to tell the person to go privately to the pastor. An open investigation of the truth of rumors would be an unbiblical response. Later they told me that most conciliators refuse to come unless the pastor promises ahead of time to resign, and they would not accept that condition. My impression is that they want to avoid any possibility of having to find a new pastor, fearing the mess that would cause in this independent church. At this point, most of the church has left, and we don’t have money to hire anyone; the elders are just trying to move forward without ever having dealt directly with the accusations, or even having done any teaching on how to handle conflict. But there are still some of us in the church who want things resolved, and many who have left are still trying to stir things up. Can you give me any advice on how to help them see that they have mishandled the conflict, or what I can suggest they do next?